Bengaluru: Karnataka is no stranger to water disputes with its neighbours. It has been arguing with Tamil Nadu for decades over sharing of Cauvery waters. But the river in the news now is the Mahadayi -- and the states that Karnataka is negotiating with are Goa and Maharashtra. Now, Karnataka Chief Minister Siddaramaiah of the Congress has taken offence to Goa Chief Minister Manohar Parrikar responding to Karnataka BJP chief, BS Yeddyurappa, on the issue rather than to the chief minister himself. 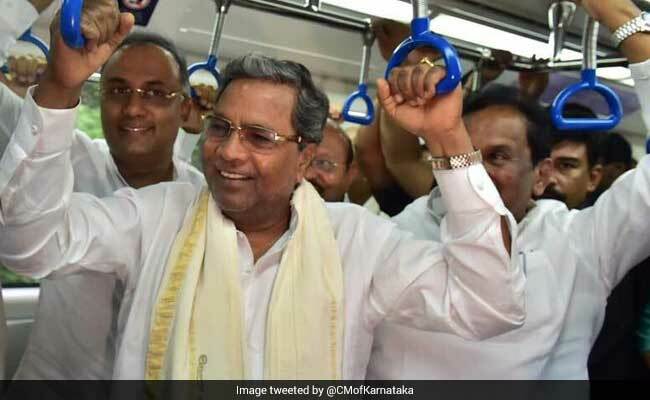 In a letter to his Goa counterpart, Siddaramaiah said, "...the Chief Ministers of the Mahadayi basin States... Karnataka, Maharashtra and Goa should meet at Bangalore on any convenient date in June 2017. A similar letter was also sent to Mr. Devendra Fadnavis, Chief Minister of Maharashtra. Letters were followed up by my Chief Secretary. However, unfortunately, there was no response from your side." Siddaramaiah in the letter said it came to his attention that the Goa chief minister has sent a letter to Karnataka BJP leader BS Yeddyurappa over the water issue, adding "I only wish you had replied to my letter, since I took the initiative for the negotiated settlement; not only on my own but also on the suggestion made by the Hon'ble Judges of the Mahadayi Water Disputes Tribunal." Siddaramaiah went on to say that he was once again asking for a meeting with the chief ministers of Goa and Maharashtra. Earlier, BS Yeddyurappa had written to Mr Parrikar on the issue, after which the Goa leader had replied and the BJP had presented this reply as proof of positive negotiations on the water issue. In his letter to Mr Yeddyurappa, the Goa chief minister had said, "Government of Goa understands that access to the drinking water is a basic human need. Hence it is to confirm it to you that on humanitarian ground, Government of Goa is willing to consider the request to work out an amicable settlement strictly restricted to drinking water only to the drought prone areas." Water wars between states are not new. But discussions over sharing Mahadayi water are sparking turbulence in Karnataka's politics. This is bound to intensify as elections are due in Karnataka next year.